Enjoy country living! Brilliantly Lit w/Natural Light this Ranch style house offer 360 degree unobstructed view of the horizon w/mountain view to the West. Open floor plan features a beautiful kitchen w/ island & breakfast bar, opens to large Living & Dining room w/ wood burning stove. Step down into the incredible family/ entertainment room w/ a wet bar, pool table & 2nd wood burning fire place, flanked by 2 patios (one to the north offers shaded area in the summer & one to the south offers winter sun), 50x28 basketball ct. Main lvl Master Suite is on its Own Wing to the south of the living area w/ study/ office/ den currently used as an additional bed. Finished bsmt offers rec/ flex rm w/ kitchenette. Plenty of room to store all your toys in the 105x57 shop -insulated, heated, lift, paint room, full bath & loft, 4 overhead doors. 2nd shop 48x33 plus a 972 sq. ft. barn. 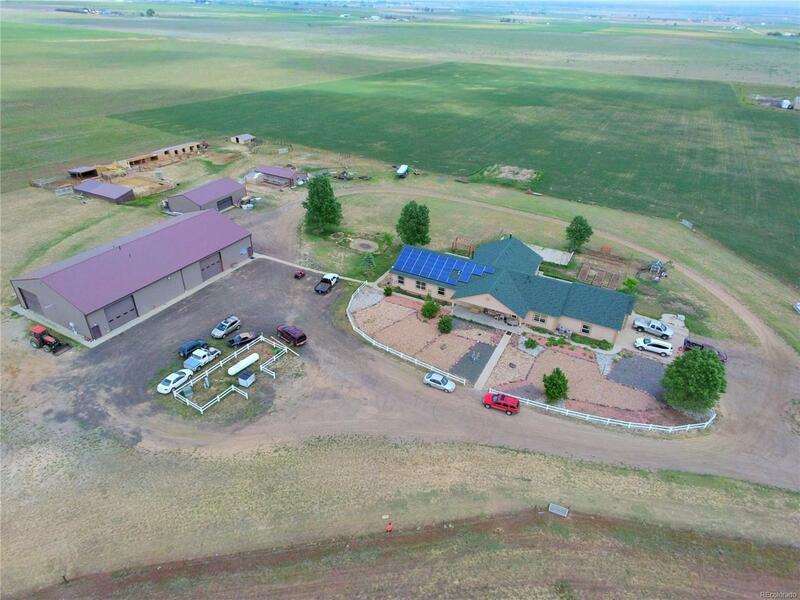 Solar Panels, new H2O filtration system, new 105 electric water heater, 2-furnaces & 2-A/C units. 40 min to Denver.